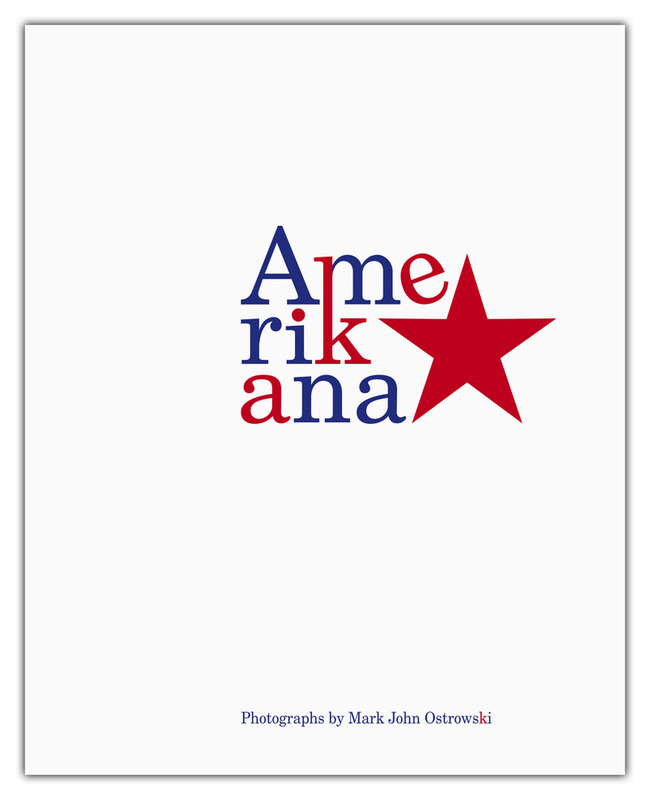 Amerikana – concerning or characteristic of America, its civilization, or its culture; broadly, this is typical of America. In a series of photographs, many of which are frequently paired, Mark John Ostrowski provides a series of photographs that places doubt on the ability of any one, or even a series of photographs, to broadly typify a culture. The background story is that Ostrowski was born in America, but moved to Spain many years ago, and has returned to America to investigate memories and a place that is no longer home. Many of his paired photographs provide contrasting viewpoints to a similar subject and investigates the broad diversity and contradictions that can be found in any culture, least a country as expansive as America. His photographs show in a documentary style the upbeat with the despondent, the light and airy as opposed to the dark and moody situations. The first photograph, spanning the two page spread, is the book’s lead in and personally one of my favorites: Central within the frame is a smiling young girl, holding a flag, appearing to be waving with her opposite hand open and showing her palm that appears like a genuine and happy gesture. She is leaning out of the back window of an older model car, with her braided blond hair, decorated with a calico ribbon, which is like her, dangling out the window. She appears young and naive, but yet enthusiast and happy. She could be picture perfect but for the Band-Aid on her forehead, a subtle and hardly noticeable defect that indicates her youth and humanity to have bumped her head sometime recently. But she does not appear to be aware of that previous bruise at this time. She is very aware of the photographer’s camera and is looking unabashed directly into the lens, making full eye contact, as to be fully engaged. 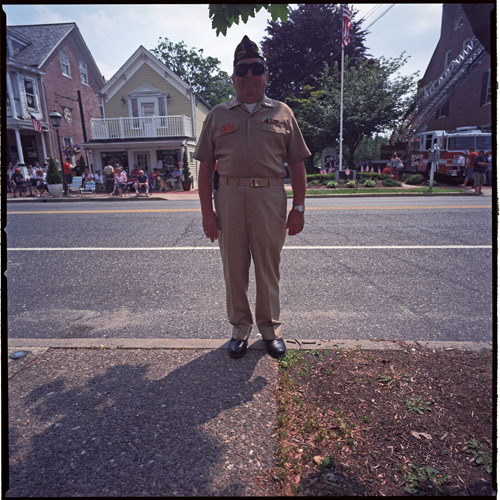 The photograph’s caption states that this is the Memorial Day parade taking place in Lumberton New Jersey and the implication is that this is one of many cars, floats and participants in this celebration parade. It is the American flag in this photograph that I believe represents Ostowski viewpoint that his America is now fractured and perhaps a little upside down, as the flag is abstractly represented in two pieces and very much out of a normal context, with the stars in the lower left and the stripes in the upper right. The young girl is holding one flag that has extended out of the left side of the photograph, but the flag’s striped field has returned back into the picture frame. The second part of the flag is attached to a small hand that is extending out from somewhere inside the car, a very mysterious hand. The second part of the flag has only the field of starts visible, with the remaining section of the flag falling down out of the picture frame. Meanwhile, a man who appears to be driving the car is in a mid-smile appears to now glancing back and down at this second flag, or perhaps the photographer whom he just drove by and whom he might have noted was appearing to take photographs. 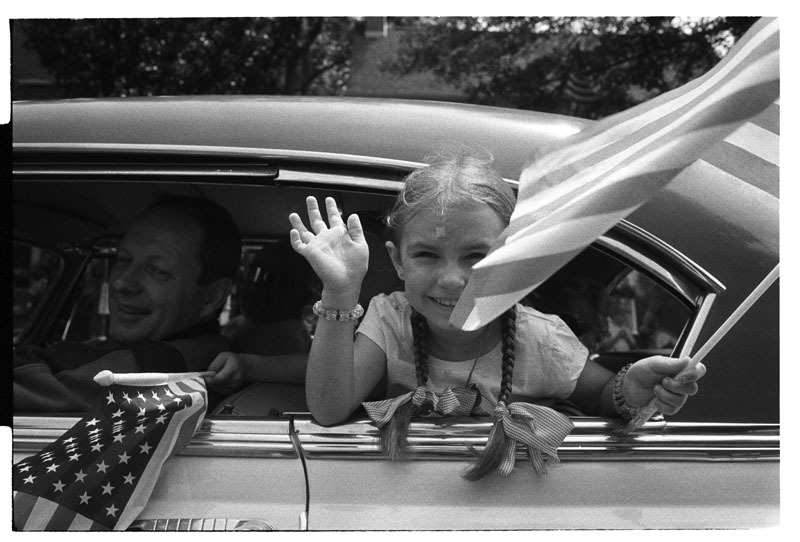 This photograph of the young girl and flag has a similar connotation to me as the Robert Frank (The Americans) photograph of the older woman who is proudly holding an American flag, but when the photograph is carefully examined, the flag is a bit worn and frayed on the edges. The slightly tattered flag is symbolic that everything is not perfect, nor as well as hoped and desired, that there are some issues and problems lurking on the edges of our culture. And probably any culture for that matter. 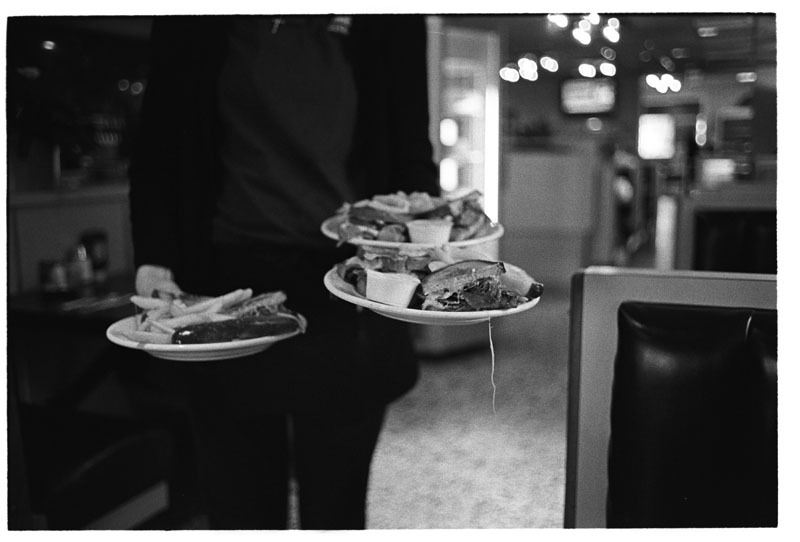 Thus we are notified that this series of photographs by Ostrowski should be considered in the context of a social commentary. Ostrowski book’s spreads include the photograph of the upbeat smiling cowgirls in western hats across from a photograph of a darkly lit saloon with what appears is a guy in a western style hat smoking a cigar and holding a bottle of beer, or a house decorated for Halloween opposite the photograph of the long, dark car waiting for the next funeral, or maybe a little bit of levity with the photograph of the tape deck found while digging around at a garage sale opposite the photograph of someone who is digging in their garden. Ostrowski also pairs up photographs of people sitting in benches or a pair of photographs of individuals with their heads bowed down for some unknown reason. He provides two points of view about similar subjects to further underline the diversity and alternative viewpoints that are available while evaluating a culture. Ostowski’s photographs are but save on color photograph, black and white. The outside borders indicate that the photographs may have been made by either a view camera or medium format camera, but nevertheless of the type of camera, there is spontaneity within the photographs, and usually a direct contact between the photographer and his subject. 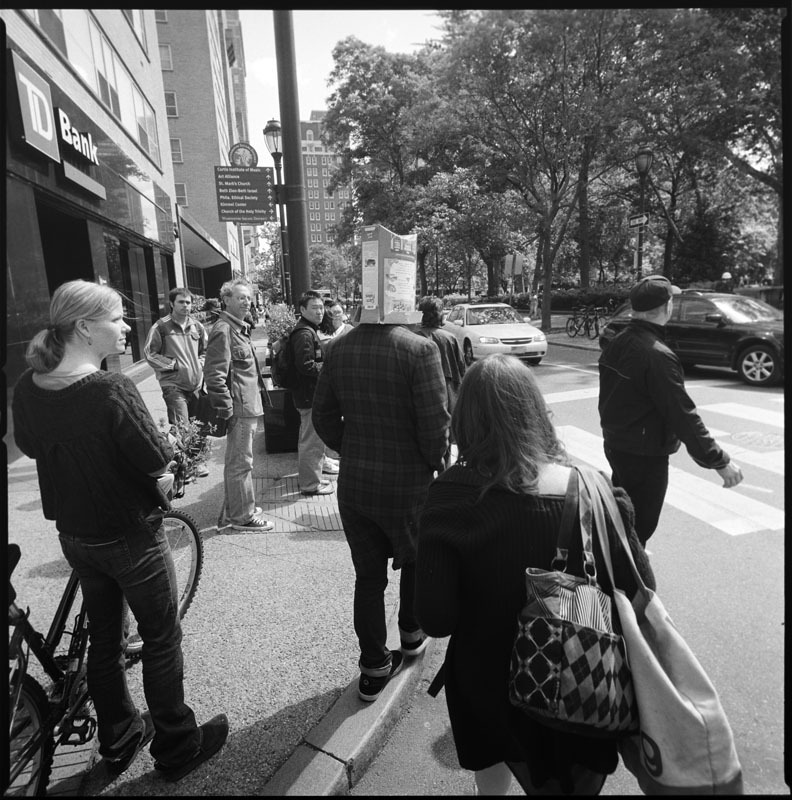 Ostrowski is a street photographer with a practiced eye for both the humorous as well as the poignant situations and has created an interesting narrative about Amerikana. The book has stiff covers, duotone printing, photographs are captioned; pages are not numbered, Introductory essay by Antonio Molinero Cardenal with the text provided only in Spanish.